The adventures of a FrontCountry MuleWoman. Trail riding in the mountains of Southern and Central California on a gaited Rocky Mountain Mule. 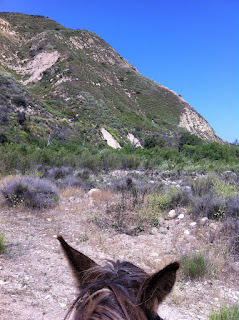 A ride from Rancho Oso on Paradise Road, across the Bathtub and Arroyo Burro Trails, in the front country range of the Los Padres Forest in Southern California. Difficulty: Mostly easy. Some areas single file in the canyon, well maintained private trails. 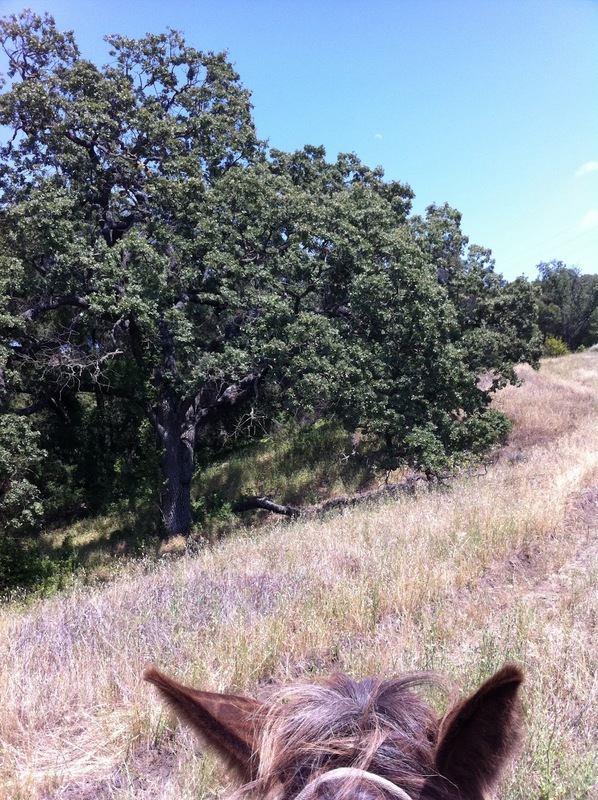 This was an easy 2 hour trail ride taken with a friend who was conditioning a quarterhorse for sale. 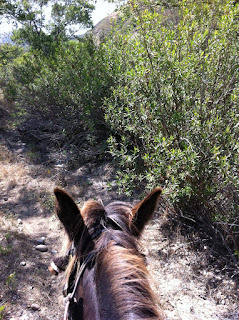 We started out at Rancho Oso and went up the Bathtub Trail. Here is a classic Valley Oak, in the open grasslands on the climb up into the forest towards Camino Cielo. The river is still very high, and the growth of rushes and cattails is extremely dense. The willows are closing in on the river on the banks and everything is beautifully green. This shows how the willows are closing in on the trails. What used to be quite open are now obscured by branches and require a bit of bashing through, and guesswork to see which way to proceed. Once we crossed the river the dry wash above it is the same rocky riverbed that continues all the way up into the canyons. but filled with flowers at this splendid season.